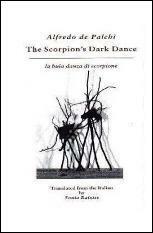 The Scorpion's Dark Dance has won reviews that any writer would envy. The American Book Review hailed these poems, written in an Italian prison after World War II, as "dark exuberance, bright anger, cutting cynicism which hammers us to the other side of apathy." World Literature Today wrote: "His harsh, unrelenting stance and his beautiful and disquietening imagery belong to one who draws in the dark while longing for the light." Small Press observed: "De Palchi masterfully creates and expands singularly intense metaphors that sometimes convey a stony, Dantesque harshness or else a transcendent Montalean complexity. There are glimpses of redemption and self-insight, but they occur only intermittently and are clearly hard-won."